With the next #geomob event coming along tomorrow (30th June, deets below), we thought you’d like to know what it’s like and why you’d be doing yourself a favour for going along. Yahoo has finally released Fire Eagle, their much-discussed location service. Bloggers have been banging on about it for ages, which became all the more heightened after it was shown to the delegates by Tom Coates at eTech in March. Yahoo has firmly rebuffed a deal from Microsoft that would have seen the search giant selling off its search business and handing over the rest of the company to ‘activist investor’ Carl Icahn. Shares in Internet old skoolsters Yahoo crashed by fifteen per cent on the weekend after Microsoft walked away from protracted takeover negotiations. Microsoft had been waving a fearsomely hefty £24bn wad in Yahoo’s face since January, but gave out a firm “talk to the hand” instruction after their takeover deal failed to be accepted. 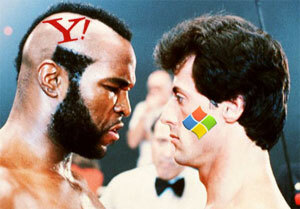 The tussle between Yahoo and Microsoft has gone through a couple of extra rounds of late. 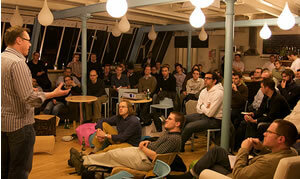 We thought we’d bring you up to date with the current state of play. 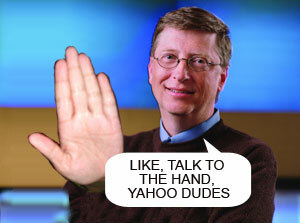 Back in Feb Microsoft offered Yahoo $44Bn. 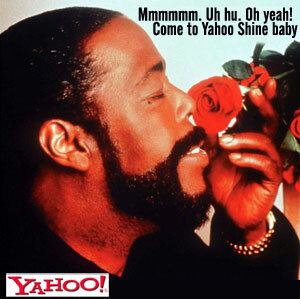 Yahoo said no thanks. We’re not sure if women should be patronised or pleased, but Yahoo is launching a new site aimed at the “key demographic” of laydees aged between 25 and 54. Called ‘Shine’ and launched this very day, the site’s main function appears to be to offer new opportunities to flog targeted advertising for consumer-packaged goods, retail and pharmaceuticals. Fresh from a deep mining expedition into the Buzzword caves, Yahoo’s PR team have returned with an impressive collection of hyperbolic nuggets for our delectation. It’s being reported that there’s ‘secret’ discussion going on between Rupert Murdoch’s News Corp and Yahoo, apparently in an attempt to find an alternative route to Microsoft buying it. 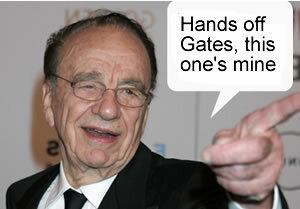 Continue reading Murdoch Interested In Yahoo?